“This is the largest post-season crowd we’ve ever had,” Ranger Michael Kelly (Christopher George) informs his staff in the opening moments of Grizzly (1976). What it’s all about: As they head out on patrol, one of them comments that, “There’s no way we can keep an eye on all of those backpackers.” In other words, it’s going to be a smorgasbord of campers for some lucky killer bear. It’s not long before spooky point-of-view camera angels menace two lovely ladies. While packing up camp, the first girl is surprise attacked by a giant furry paw. Her arm is ripped off and she’s vigorously tossed back and forth. It’s not too surprising that this first bear attack is similar to the first shark attack in Jaws (1975), the movie that served as “inspiration” for Grizzly. The second girl makes a mad dash through the woods and finds shelter in an old shack. Her salvation is short lived. The bear (once again, only it’s paw is visible) smashes through the walls as if they were cardboard and quickly dispatches his victim. Ranger Kelly and perky wildlife photographer Allison Corwin (Joan McCall) find the first body at the shack. They continue the search for her friend even after night falls. While acting as an impromptu crime scene photographer, Allison literally stumbles across the second body. According to the DVD commentary track, a portion of this scene was re-shot inside a roller rink. Even with the clarity of DVD, the scene is often so dark that it’s impossible to tell if they’re in a faux forest/roller rink or on the moon. Next, a pretty young park ranger is stalked by the bear-cam as she strips down for a refreshing swim. Duh-dum Duh-dum. With a blatant rip-off of the John Williams score playing on the soundtrack, she is attacked underneath a waterfall. “Sure, you’re not killing the bear.” Okay. Maybe she’s not so sympathetic, though it doesn’t really matter. Despite the fact that Allison has clearly been set up as Kelly’s love interest, she disappears from the film after another brief scene. Later that night, a camper excuses herself from the campfire to slip into something more comfortable. While preparing for bed, the Grizzly strikes, attacking the woman in her tent. She’s swung violently around, an odd effect that’s achieved by flipping the film upside down. The moment is strangely surreal. While in her final death throes, her hair defies gravity and falls up. That night, the bear sneaks up on a group of hunters. Anyone who’s dumb enough to stay out past nightfall and sleep out in the open while a killer Grizzly is on the loose, gets what they deserve. Luckily, it’s only a cub that stumbles into their camp. They get the bright idea to use the baby bear as bait. “Old mom will come by… Pow.” The Grizzly comes by and eats the little bear. Ranger Kelly, Stober, Scott and the three hunters set up strategic posts in hopes of catching the bloodthirsty beast. Come daybreak, young Ranger Tom (Tom Arcuragi) stands high atop a remote watchtower. You would think that a 15-foot Grizzly would be kind of hard to miss, but the devious critter sneaks up on him and tries to shake Tom loose. The watchtower eventually folds like a house of cards and poor Tom is killed in the fall. A mother and her young child become the next victims of a bear attack. While playing in the yard with his pet rabbit, the little boy is suddenly (and graphically) torn to shreds by the grizzly. Mom attempts to fend off the beast, but she also becomes bear chow. Kelly and Stober load up their helicopter and fly out over the forest. They land and manage to lure the bear close, but their trap fails and the bear runs off. For some reason, after chasing him across the rugged terrain on foot, Kelly seems genuinely surprised that they weren’t able to catch up with him. Night comes and goes. Scott, who’s been riding a pony through the woods, is attacked while tracking the beast. The Grizzly takes a swipe at the horse (decapitating it) and claws at Scott. The bear partially buries him, saving him for a snack later on. When Scott awakens in a shallow grave, he finds that the Grizzly wants his dinner sooner rather than later. Kelly and Stober eventually find what is left of their friend. Continuing their search from the air, they spot the Grizzly and chase it. Our heroes eventually land in an open field where the stage is set for the final confrontation. Jaws set the gold standard for the ubiquitous man vs. beast finale and Grizzly doesn’t veer far from the successful formula. The Grizzly immediately attacks the chopper and the men fend it off with riffles. They each manage to get several good shots into the growling monster, but Stober succumbs to a great big bear hug. Up until this point, the bears and the human actors have never appeared together in the same frame. Prine is briefly shown next to one of the trained animals, but it is a stunt man in a bear costume that gives him the squeeze of death. Kelly pulls out a rocket launcher…yes, a rocket launcher. If they had a rocket launcher lying around, why didn’t they just use it on the bear in the first place? At any rate, Kelly fires and the Grizzly explodes in a massive fireball. A lone harmonica plays a melancholy tune on the soundtrack as Ranger Kelly kneels over the body of his fallen friend. If Stober were still alive, he’d undoubtedly wish that Kelly had thought of that rocket launcher just a little sooner. In conclusion: Auteur William Girdler cranked out several low-budget gems in the seventies. Some of his most memorable titles include Abby (1974), Day of the Animals (1977) and The Manitou (1978). Though Grizzly was by far his most successful film, Girdler never saw a dime thanks to a legal dispute that arose after the film was released. 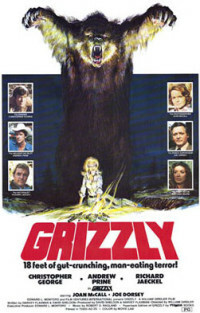 A novelization of Grizzly was published to coincide with the film’s release. According to the folks at www.williamgirdler.com, the book not only features first-person accounts from the bear’s perspective (he’s just misunderstood) but it also offers up the points-of-view of Scott’s horse and the pet bunny rabbit! The book also presents a slightly different ending than the one that appears in the film. Ranger Kelly uses a flamethrower (which makes about as much sense as a rocket launcher) to destroy the grizzly. Also in the novel, Stober survives his bear attack. It’s possible that this ending may have once been part of the final film. As the credits begin to roll, Kelly kneels by his fallen friend whom we assume is dead. If you look closely, Andrew Prine’s fluttering eyelids don’t exactly give the impression that Stober is truly down for the count. An often talked about, but seldom seen sequel, Grizzly II: The Predator, was shot sometime in the early eighties. With a script by the man who penned the original, the movie was apparently shelved when problems with the special FX bear arose while filming in Hungary. It is said to feature Charlie Sheen and George Clooney in their earliest film roles. The 30th anniversary double-disc special edition DVD of Grizzly presents the film in anamorphic widescreen (2.35:1) and features a commentary by actress Joan McCall and producer David Sheldon. A short vintage promo titled Movie Making in the Wilderness contains interview footage with the director as well as a behind-the-scenes look at the difficulties of shooting while on location in Georgia. Jaws With Claws includes interviews with producers Sheldon and Harvey Flaxman and stars Andrew Prine and Joan McCall. Sheldon relates how, early in the production, the mechanical bear (constructed by an L.A. taxidermist) was accidentally left out in the rain. It became impossible to match the look of the matted animal fur to the shots of the live bear. Consequently, the mechanical grizzly is only seen fleetingly in the final film. The disc also includes a short fanboy segment, Reflections of Grizzly, a small poster/photo gallery and two radio spots.